This recipe is adapted from one in Top Pot Hand-Forged Doughnuts: Secrets and Recipes for the Home Baker. Old-fashioned doughnuts are fried at a lower temperature than other doughnuts and turned twice while frying, which gives them their characteristic crunchy petals and grooves—perfect for holding onto a sweet glaze (recipe included below). The sour cream in the dough keeps these doughnuts wonderfully moist. Note: while there are multiple steps to this recipe, these doughnuts are broken down into workable categories to help you better plan for preparation and frying. In a medium bowl, combine flour, baking powder, salt, and nutmeg. Set aside. Mix sugar and shortening in a standing mixer or with a hand-held mixer until sandy - about 1 minute. Add the egg yolks and mix until lighter and thicker - about 1 minute. Stir in flour mixture, being sure to combine dough thoroughly. Cover dough and chill for at least 45 minutes and up to overnight. Heat a large, heavy pot with at least 2 inches of oil in it to 325 F.
While oil heats, roll out dough on a well-floured work surface. Roll out to an even 1/2-inch thick. Use a doughnut cutter or a 3-inch circle and a 1/2-inch circle cutter and cut out as many doughnuts (and doughnut holes) as fit. Gently knead the remaining dough back into a mass. Re-roll to 1/2-inch thick and cut remaining doughnuts. Dust off any excess flour from the doughnuts and gently slide a few into the oil. Fry only as many as will fit in the pot without touching. Once the doughnuts float to the top of the oil, fry for 15 seconds. Gently flip them over and fry until golden brown and cracked - about 90 seconds. Flip back over and finish frying until golden and cracked on the second side - about 75 more seconds. Transfer cooked doughnuts to a cooling rack (you can set it over a tray or layers of paper towels to catch the grease). Whisk the powdered sugar, corn syrup, salt, vanilla, and 1/2 cup hot water in a medium bowl until smooth. Dip doughnuts in the warm glaze while they are also still warm. Let sit to cool and set up for 10 to 15 minutes before serving. 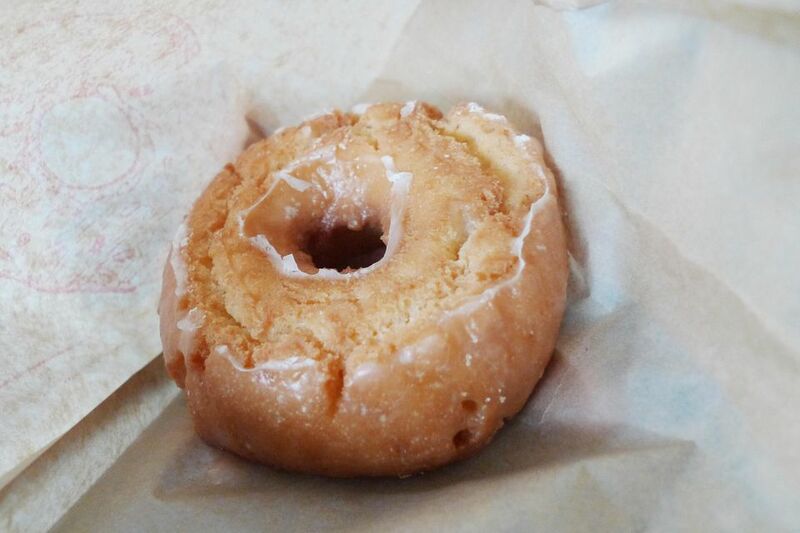 Old-fashioned doughnuts keep better than other types of doughnuts, but they are still by far at their best when eaten the same day they are cooked, and they're really extraordinary while still warm. For super extra tender doughnuts, use cake flour. But they really are plenty tender and delicious with regular old all-purpose flour, too. If you liked these doughnuts, you might want to try our delicious homemade raised doughnuts or whole wheat doughnuts.